nine − seven = Required Please enter the correct value. Facebook Inc. (Nasdaq: FB) CEO Mark Zuckerberg posted a message on Facebook on Dec. 1 stating he was going to donate 99% of his FB shares to charity. The day following the announcement, the Facebook stock price dropped 1%. In his post about the seemingly generous gift, Zuckerberg stated that his FB shares would be donated to the Chan Zuckerberg Initiative. The purpose of the Initiative, run by Zuckerberg and his wife Dr. Priscilla Chan, is "to join people across the world to advance human potential and promote equality for all children in the next generation," Zuckerberg said. The intentions sound noble, but retail investors scoffed at the fact that the "charity" was formed as an LLC. 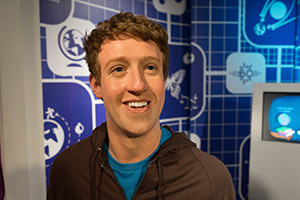 The long-term profits for FB shareholders should outweigh any concerns about the donation. This year, Facebook started monetizing one of its social media platforms. And research company eMarketer expects this social media site to bring in close to a billion dollars in ad sales this year alone.